Dessert Darling The Ultimate Gift Guide for Valentine’s Day | Dessert Darling makes the most delicious truffle fudge bites that quite literally melt in your mouth and send you to Heaven. John Kelly’s packaging is masculine and sleek, making it the perfect present to gift your guy. Gentleman, if you want to score some serious points with your lady this Valentine’s Day, invest in a gorgeous box of chocolates by K Chocolatier. 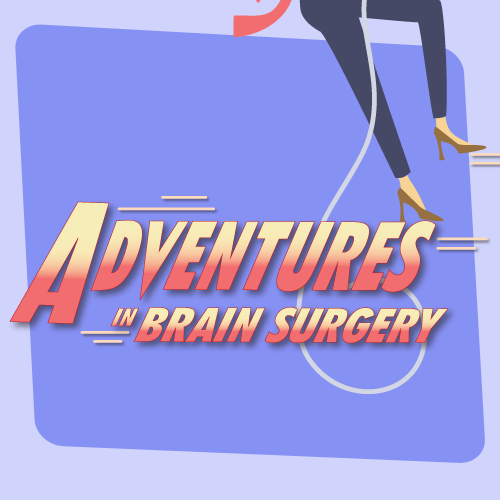 Intoxicate her with the delicious vodka balls, or delight her with the dark chocolate truffles that were once hand-made for Jackie O. 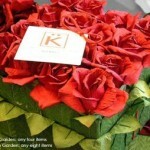 When the chocolate’s all gone, the box with paper mache roses can be used for keepsakes for years to come. Teuscher Chocolates from Switzerland not only makes some of the most delectable chocolates, but also they boast the most whimsical and playful packaging. Treat your daughter to a small ladybug box, or your son to a lion box. 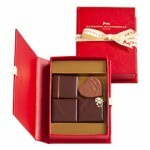 But don’t forget to treat yourself to their famous, signature champagne truffles first! Totally divine. Not everyone is excited to sink their teeth into butter and sugar. 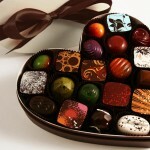 Fear not, now health nuts can receive sweet love this Valentine’s day too with a box of Benchic Chocolates. These homemade, raw, organic, and vegan treats are made with only six simple ingredients that are all actually good for you! And the craziest part? The even taste extraordinary. No one deserves a little TLC more than Mom. 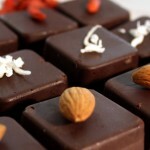 Honor her with these delicious and gorgeous gems of chocolates by Christopher Elbow Artisanal Chocolates. Let Dad know he’ll always be your first Prince Charming with some exquisite chocolates from La Maison du Chocolate. 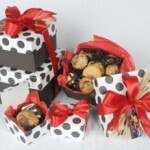 These fine treats are shipped in daily from France and come in these sweet and masculine book boxes. 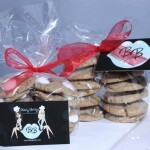 Whether your friends are in relationships or not, show that they are loved with darling, cellophane-wrapped baggies of these delicious mini-cookies by Baking Betty’s. Each treat is baked from scratch and made to order. Their signature cookies sport soft and sweet marshmallows that make them effortlessly light and totally enjoyable! Yes, even your platonic guy friend or brother can partake in this holiday thanks to your thoughtfulness. Be their hero with a box of Cookies By Joey. These massive cookies are legendary for their extreme deliciousness. Indeed, they may be the best cookies he’ll ever have. Make sure he shares though or his friend status will be seriously jeopardized. 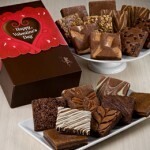 There’s something for everyone in a box for Fairtytale Brownies. These individually wrapped gourmet, Belgium brownies are soft, rich, and divine. With flavors like peanut butter, mint, walnut, toffee, and more, you’re sure to have a happy ending. I approve of 1-6 wholeheartedly – and just don’t know anything about 7-9. Great taste in chocolate, as always. Especially K Chocolatier – oh, to be back in SoCal. Excellent choices!!! I love all of these!